Joshua, Police Comissioner O’Neill, and Justin together at the 75th Precinct Neighborhood Violent Crime Strategy Meeting. As a community-based school, WHSAD recognizes the need to develop lasting relationships with organizations in order to inspire and advocate for our students. Ms. Dana Rachlin and NYCTogether bring a crucial element to WHSAD, and we appreciate the organization’s continued support of our future leaders. The following narrative comes from the NYCTogether website. Ms. Rachlin and her team have been instrumental in bringing adolescents and New York City police officers together in creating a dialogue that promotes constructive relationships for the betterment of the city’s future. WHSAD’s students have enjoyed numerous opportunities to express their thoughts regarding personal and societal concerns. It’s not every day that a high school junior gets to share his ideas on how to reduce crime in his community with the Police Commissioner, but at NYC Together, our students are empowered to become leaders in their communities; not just in the future, but right now. This isn’t Josh’s first time stepping up as a leader in his community. As a sophomore, Josh and his peers were looking for a new after-school program, so they asked their school administration for help. That’s when his school pointed him to NYC Together, and he’s been involved ever since. Representing NYC Together, Justin and Josh joined a group of community members and NYPD officers to create and implement a new vision for nine precincts in New York City that have violent crime rates more than twice as high as the rest of the city. When first asked to attend such an important meeting, Josh said, “It felt like woah, we gotta prepare. We didn’t really know what to expect.” When they arrived, Josh noticed a familiar face in his small group: Chief Maddrey. Josh and Chief Maddrey met previously through an NYC Together program dinner, which helped Josh feel more comfortable sharing his ideas with the group. 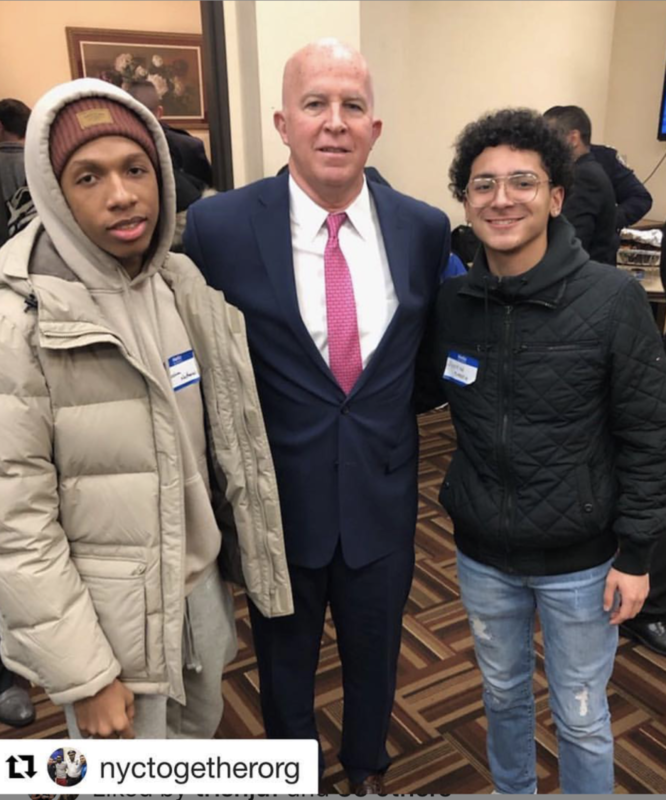 The goal of the meeting was to make New York City safe and fair everywhere, but it also proved to be an opportunity for Josh to make meaningful connections with NYPD officers and other members of his community. “I learned a lot just being around people. Getting to see how they thought, how I thought, things aren’t that different. Being able to touch base with the people who live in these communities and the ones who are supposed to protect it was crucial.” he said.